The washer uses far less water, less than you would think could clean anything. Before, I thought if you opened a front-loader mid-cycle, water would spill out everywhere. Not so, because the clothes at their wettest are merely soaked. The dryer filter ends up with a fraction of the lint the old machine produced, ergo clothes must be less beat up in this process. 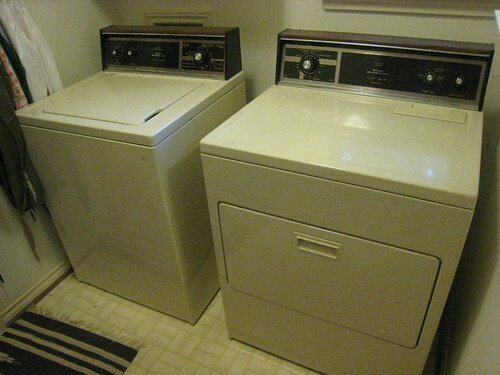 The “Steam Refresh” cycle on the dryer removes odors and wrinkles. I am gradually refreshing more things instead of washing. The stationary drying rack lets you dry items like sneakers and delicates without tumbling. This Samsung pair was disturbingly expensive but ranked first in the Consumer Reports test. I highly recommend if you have to replace your set. It’s a lucky week for me. Check out my new find. It’s a greenhouse! Recovered from brush and bulky! Without a doubt my best (and largest) trash find ever. The process of acquiring the greenhouse was quite a thrill. I spied it on a nearby block while riding in a car with a business associate. She had driven us from an office downtown to a meeting in Garland. We swung back through my neighborhood so she could show me a house she’s thinking about buying on our way back to the downtown office. It was pure coincidence that this block was a quarter mile from mine. I thought about asking her to stop the car so I could exit and examine it, but I wasn’t sure that would give such a good impression. Let’s talk business… no wait a sec, lemme go pick through this pile of trash over here first. After returning downtown to fetch my car, I drove back and eventually found it again. A neighbor and a couple passing cars were eyeing the structure, which was sitting in the street, just past the curb. I knew time was of the essence here, it was quite heavy, and I didn’t have the truck. Hmmmm, how to move something fast during the day in my neighborhood? Lawn crew! It took about ten seconds to find some guys with a flatbed. Communicating was difficult, but with hand signals and gestures they got the point that I needed some help moving something a few blocks. I offered $30 but ended up paying $40, as it required moving a bunch of equipment from the trailer to the truck. In retrospect perhaps I should have been more shrewd. I find that the rule of Craigslist, garage sales, and just about every other junk transaction is that you should take the asking price or first number you expect to pay, and knock it down by about a third. Maybe more. For now it’s in my back drive, waiting for me to figure a final space for it. It needs a replacement roof panel, and it could do with a new paint job on the frame, but other than that she seems good to go. In the spirit of naming great estates and boats and all things fancy, I am naming her The Ravendale Greenhouse, for the street on which I found her.